This treatment involves a facial massage using a gua sha board made of jade or rose quartz. This treatment lifts and sculpts the skin and relaxes the muscles of the face in order to prevent fine lines. It is also effective in addressing tension headaches sinus issues and/or jaw tightness. Modalities that may be included in this treatment: hydrating mask, jade rolling, facial cupping, thyroid-balancing lymph drainage, LED light therapy and constitutional acupuncture points to aid the facial treatment. (You may choose to have this treatment without the constitutional acupuncture, however it is highly recommended!) 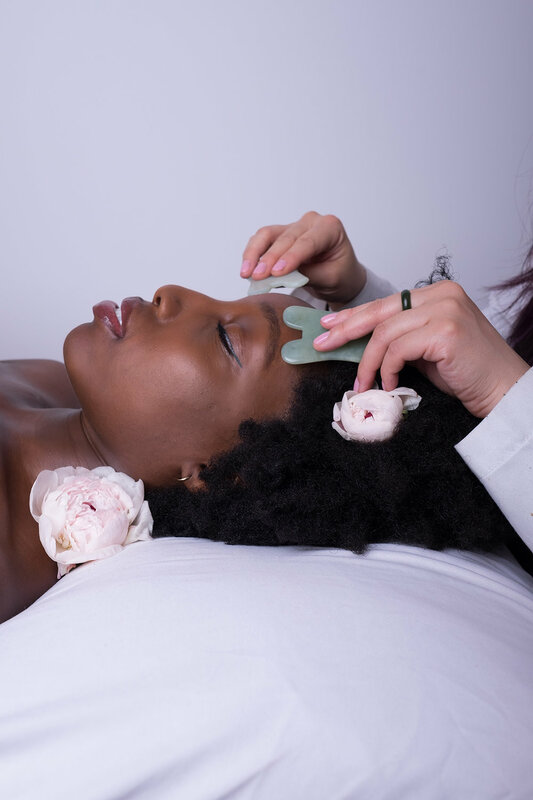 If you’re interested in facial acupuncture but have not had any experience with acupuncture, please consider facial gua sha first. Please let me know if you have skin sensitivities or allergies to certain products.